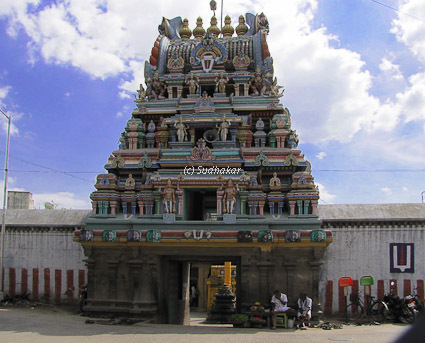 Thiru Ooragam, is one of the 108 divya desam temples situated in Kanchipuram. Mahabali Chakravarthy, the grandson of Prahalad though belonging to the Asura community, was good-natured and he was very generous and charitable. He became proud of his qualities and the reputation it brought him. The Lord wanted to teach him a lesson. The Lord took the form of a dwarf and approached Mahabali for three steps of land by his steps. The surprised king told the dwarf that three steps by his legs would fetch nothing to him. His Guru Sukrachariyar realized that the dwarf is none other than Sri Narayana and warned king Mahabali not to yield to his demands. Bali told the Guru that he would have to lose all the benefits of his earlier charities if he denied the demand of the dwarf. He asked the dwarf to ahead and take three steps of the land.. The dwarf suddenly became tall touching the sky, measured the earth by one step and the celestial world by the second leaving no land either in the sky or earth and demanded the third. Bali simply said that he could place the third step on his head. Doing so, the Lord sent him to the world below the earth. Reaching the lower world, Mahabali felt sad that he could not see the Lord measuring all the worlds in two steps. Mahabali began to perform a severe penance on the Lord to see the Lord measuring the world. The Lord gave him the darshan as Adisesha again. That place is now called Thiru Ooragam, which is on the left side of the sanctum sanatorium. 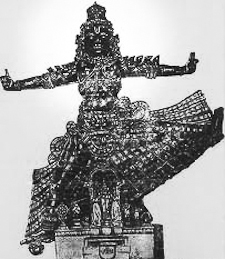 Moolavar is known as ThiruVikraman, or Ulagalantha Perumal(one who measured the Earth) in a standing posture facing West and is over 30 feet in height. Left leg is seen lifted at a right angle. Right leg is seen placed on Mahabali’s head. Two fingers on his left hand stretched out referring to the two steps he took to measure this world. One stretched finger on his right hand indicates the question the Lord asking MahaBali as to where he could place his third step. Thaayar of the temple is Amudhavalli (Amirthavalli),Utsavaar of the temple is Sri Loganathan. The temple is revered by the verses of Tirumangai Alvar and Thirumazhisai Aazhwar. There are 3 other divya desams inside the temple - they are Thirukkarvaanam , Thirukaaragam , Thiruneeragam. Temple location In the heart of the Kanchipuram town and on way to Kamatchi Amman temple. How to reach? Kanchipuram is around 75 kms from Chennai off the Chennai Bangalore highway via SriPerumbudur. It is well connected by several bus services from Chennai. There is a railway station in Kanchipuram with a few train services from Chennai in the mornings. Other interesting places around Kanchipuram It is a temple town with 15 out of the 108 divya desams spread around here. Kanchi Sankracharya mutt is in the heart of the town.